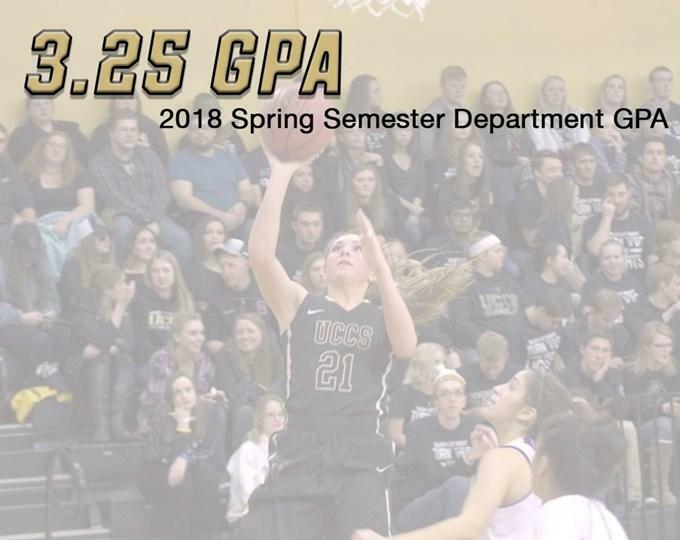 For the 28th straight semester, the UCCS athletic department earned a 3.00 grade point average or better. The Mountain Lions closed 2017-18 with a spring GPA of 3.25. Overall, the department recorded a 3.26 GPA for the academic year. Fourteen of the Mountain Lions 16 varsity programs earned a 3.00 GPA for the spring semester, including five programs with a GPA of 3.50 or higher. Women’s basketball led the department with a 3.623 GPA, followed by volleyball (3.601), men’s golf (3.58), women’s soccer (3.568) and softball (3.568). For the academic year, women’s basketball led all 16 programs with an overall GPA of 3.623. Volleyball earned the second highest team GPA (3.587) and men’s golf is third overall (3.534). The Mountain Lions continued their success on the field of competition this semester. Both the women’s indoor track and field women’s golf programs won their first-ever conference championships, followed by the women’s golf team qualifying for the NCAA West Regional Tournament. UCCS’ men’s and women’s indoor track and field teams qualified six student-athletes to the NCAA Division II Indoor Championship Meet and are sending 11 to the NCAA Division II outdoor championship meet May 24-26. Men’s golf competed in its sixth NCAA Division II championship tournament this season. Individually, 40 Mountain Lions were named to the President’s List, and 46 were named to the Dean’s List. To qualify for these semester honors, students must be enrolled in a minimum of 12 graded hours during a regular semester (Fall or Spring). Students who achieve a 3.75-3.99 grade point average are placed on the Dean’s List. Students who achieve a 4.0 grade point average are placed on the President’s List.